Mike Tyson was a predictable boxer. Michael Jordan was a predictable basketball player. Tom Brady is a predictable football player. It doesn’t matter how hard you study. If you’re not good enough, you will lose. That’s the predictable part. A few days ago, in the Cowboys-Giants game, Odell Beckham Jr. made a very difficult catch. How? He just did it. 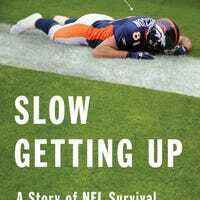 Excerpted from the new epilogue to Slow Getting Up: A Story of NFL Survival from the Bottom of the Pile, now available in paperback. We published an adaptation from the book last year.